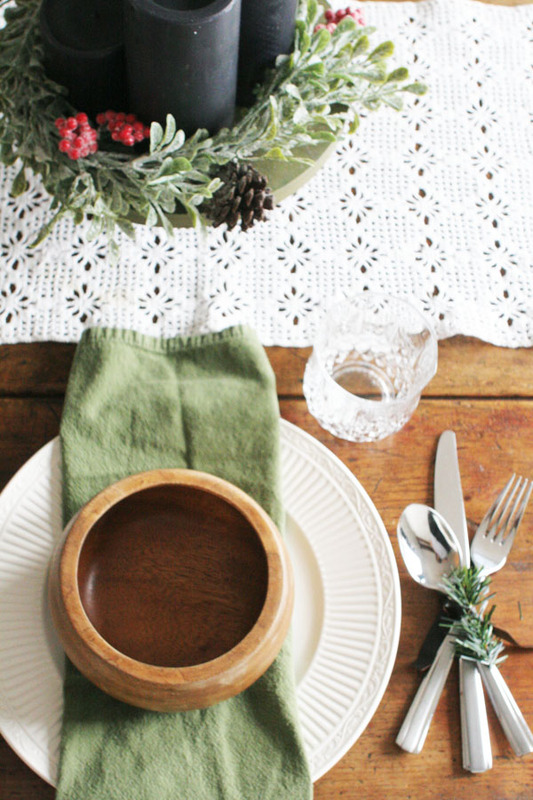 Set a rustic Christmas table in minutes with basic pieces and a few festive details. 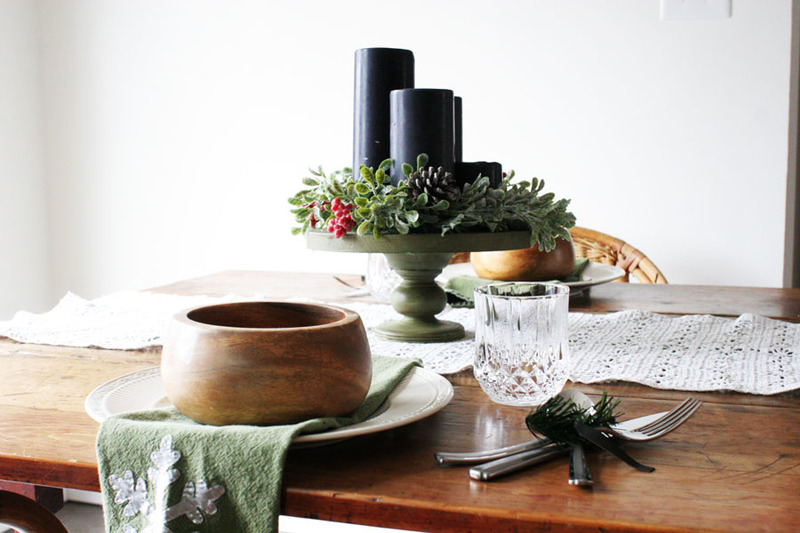 An easy Christmas centerpiece anchors the rustic tablescape for a timeless look. 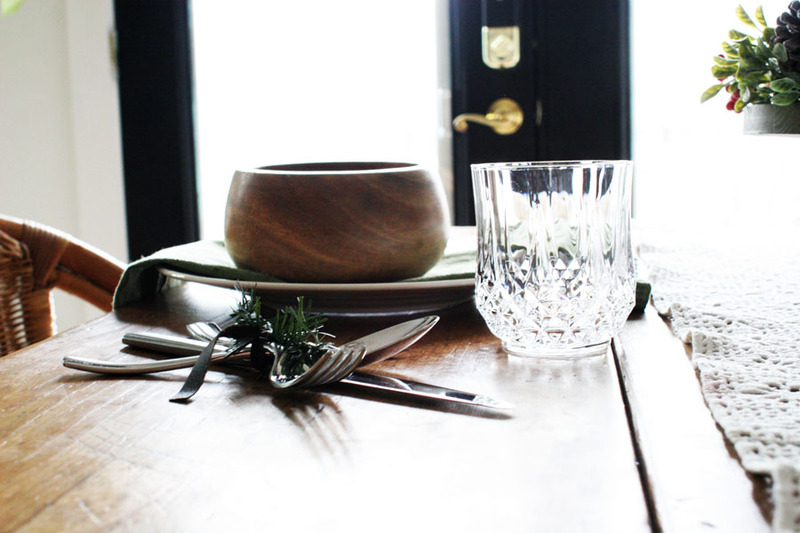 Welcome to the Holiday Tablescape Blog Hop! It’s been a while since I’ve been able to join in with these lovely ladies and I’m happy to be back. 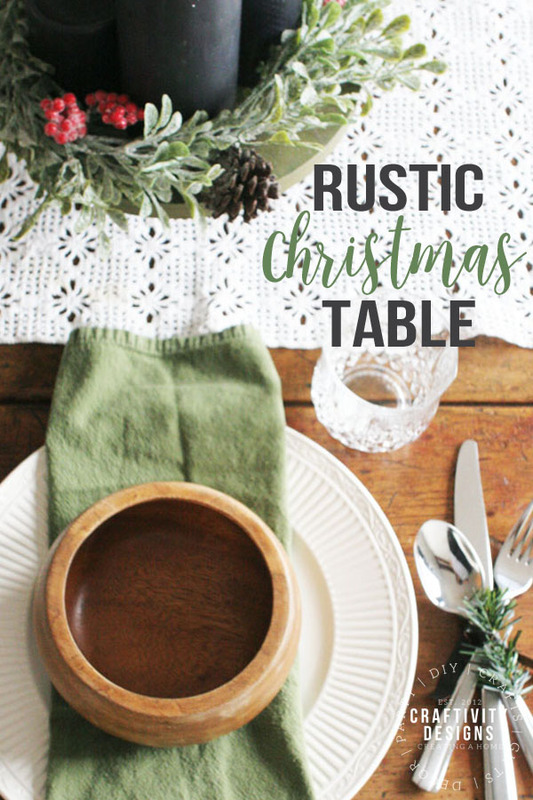 After you take a peek at my rustic Christmas table, make sure to visit the rest! We’ve been slowly chipping away at completing the kitchen makeover in our Modern Cottage (here’s the before pictures). While the project is “on pause” for the holiday season, I’ve still got some new photos to share with you today! You’ll get a glimpse at the opposite end of our kitchen, where the breakfast nook and exit to our deck, is located. Speaking of the exit to our deck, I love how those black patio doors look from the exterior of our home, too! I had been itching to try dark doors for some time, and I don’t regret it a bit. The doors pop against the white trim and walls, setting a dramatic backdrop for the antique drop-leaf table. Our antique table has a rustic, worn finish, so I simply tossed a lace runner across the center. 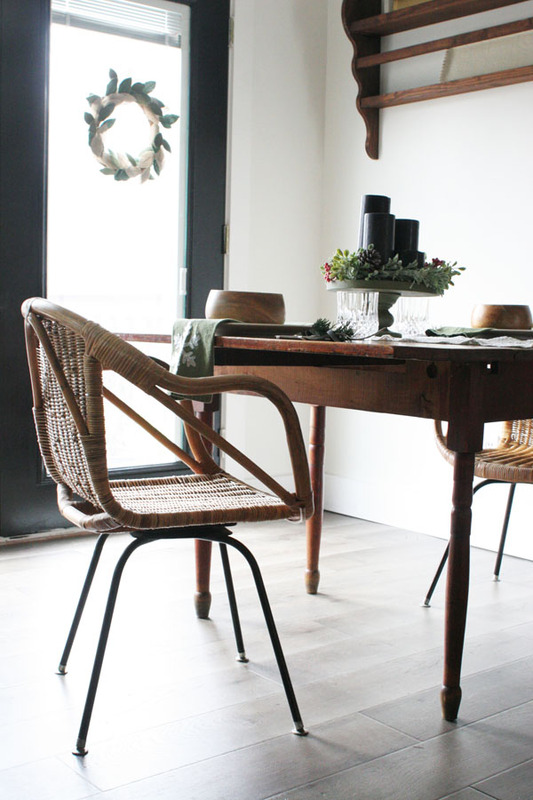 If your dining table feels shiny and new, you might use a lace tablecloth. That will allow the warmth of the wood to pop through the openings in the lace while hiding the less-rustic elements of the table’s finish. Atop the lace runner is a timeless Christmas centerpiece (and one of my favorite holiday projects ever). This modern Advent Wreath is an easy project that looks custom-made. It is the focal point of the table, while also acting as a tool to celebrate the Advent Season with our family. 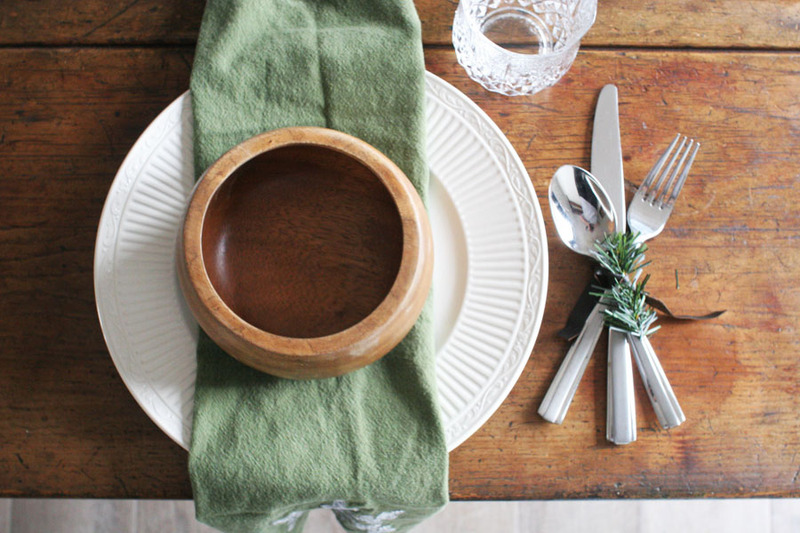 Each Christmas place setting is complete with a basic white plate, wood bowl, green cloth napkin, and a set of silver utensils. 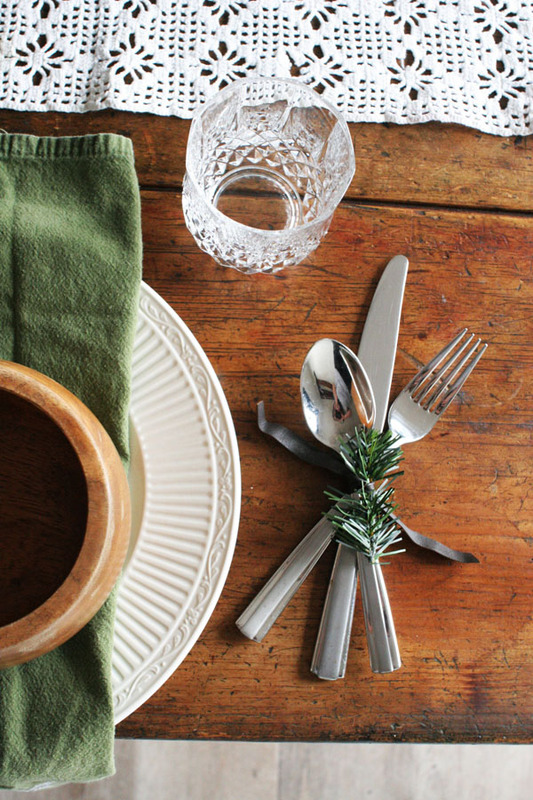 The utensils are wrapped with a simple Christmas napkin ring that continues the rustic theme. 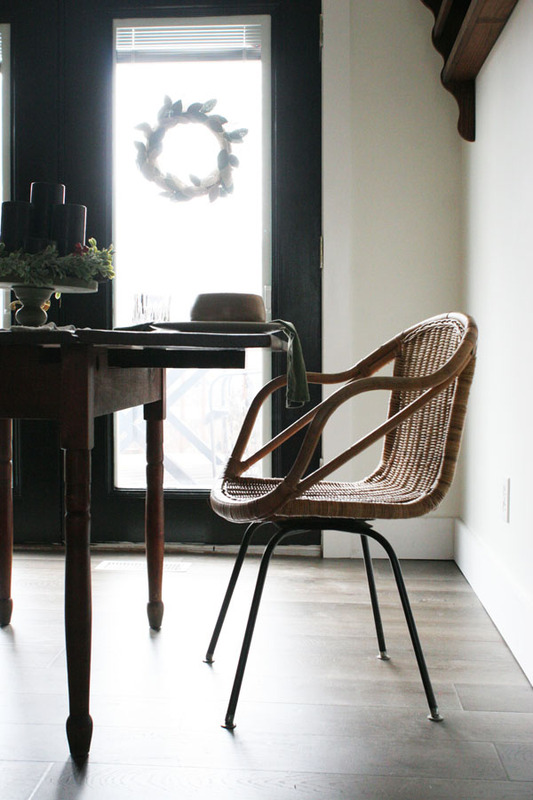 Also warm and rustic, is our pair of wicker chairs flanking each side of the antique table. If I recall correctly, I paid $40 (for the set!) from a consignment store. I love the texture they add in this corner of the kitchen. Texture. That’s truly what a cozy, rustic, Christmas cottage home is all about. I love this final shot… with delicate lace, natural greenery, soft linen, and warm wood. Now, don’t run off… make sure to stop by and visit these talented ladies, too! Beautiful tablescape! And your kitchen is looking great! I am obsessed with the simplicity of this! The white and green look so good against your wood table. And YES, texture is where it’s at!! Thank you for joining in on this hop and I hope you have a Merry Christmas! !